Another couple of units completed including a few Elite options and a badly needed HQ for the Fists. The Fists first outing wasn't as brutal as I thought it would be. They suffered the brunt of the Iron Warriors heavy firepower, but they managed to keep them occupied until the end of the battle. All from the Calth box I believe. I'll use this figure as my HQ choice for now. I have a proper HQ unit assembled, but not primed. 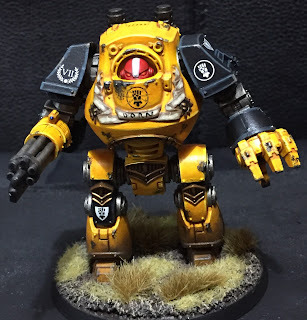 The first of 3 Contemptor's with Forgeworld decals. Up next is a Sicaran tank and Proteus Land Raider. Lovely brushwork Mike - very sharp indeed. Great work with a super hard colour to get right. Really excellent looking paint jobs.